4 Accuracy Ã‚Â±0.5% F.S.D. , Ã‚Â±0.25% F.S.D. Dial size : 6", 8" or 10"
Accuracy Required : Ã‚Â±0.5% F.S. or Ã‚Â±0.25% F.S. or any other special requirements you have. 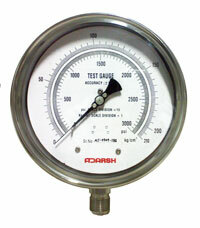 Test / Master Gauges are used in laboratories, pressure gauge calibration, instrument testing and other applications where accuracy and repeatability is important. Available in Ã‚Â±0.5% and Ã‚Â±0.25% F.S. Accuracy.